What's The Difference Between iPhone 4S and iPhone 5? You are here: Home / Apple / What’s The Difference Between iPhone 4S and iPhone 5? What’s The Difference Between iPhone 4S and iPhone 5? Although widely expected, there was no iPhone 5 in 2011, so it was surely high time for a total revision of the iPhone in 2012. And with an Apple event taking place on September 12, we were expecting to see the iPhone 5 break cover. In the US, the iPhone 5 is coming to coming to Verizon, AT&T and Sprint, from $199-$399. So, what’s the difference between Apple iPhone 4S and iPhone 5? Apple’s iPhone 5 is claimed to be twice as faster as Apple iPhone 4S while Apple iPhone 4 is powered by 1GHz Cortex A8 processor on top of Apple A4 chipset with PowerVR SGX535 GPU and 512MB of RAM which makes the iPhone 5 nearly four times as faster. Apple iPhone 5 runs on Apple iOS 6 while Apple iPhone 4 runs on iOS 4 and is upgradable to iOS 6. Apple iPhone 5 has 8MP camera that can simultaneously capture 1080p HD videos and images with panorama while Apple iPhone 4 has 5MP camera that can capture 720p HD videos. Apple iPhone 5 has 4G LTE connectivity while Apple iPhone 4 only offers 3G HSDPA connectivity. 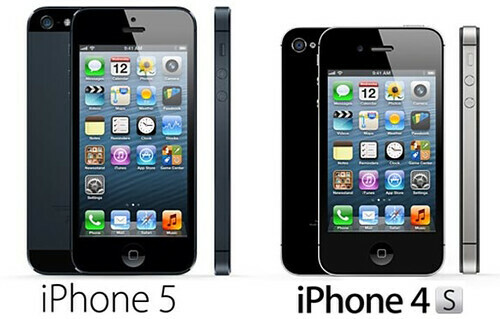 Apple iPhone 5 is taller, thinner and lighter (123.8 x 58.6mm / 7.6mm / 112g) than Apple iPhone 4 (115.2 x 58.6mm / 9.3mm / 137g). See also, iPhone transfer software for you to move photos, videos, music, apps between iPhone 4s and iPhone 5.